Trials. Tenacity. Triumph: A true story. Marine. Guardian. Trooper. Convict. Messenger. Matthew Creighton, the eldest of seven children, was born and raised in rural Alabama. His two brothers died as infants, but Matthew decided, as a little boy, that he wanted to play pro football. He saw how his first cousin had benefited from going pro, and he wanted to do the same thing to make life better for his parents. Unfortunately, when he was only 16, his mother died from diabetes. A little over a year after he graduated from high school, tragedy struck once again, and he and his sisters buried their father on Matthew's 19th birthday. At the age of 19, he became the legal guardian of his four young sisters. Pushed into parenthood at such an early age, Matthew needed a better job. He became a very successful Alabama State Trooper, reaching the rank of Lieutenant. Unfortunately, he got sidetracked, and lost his 18-year Trooper career, and was in and out of prison three times. In July of 2012 Matthew spoke to a group of young people, knowing it was time to get his “don’t get sidetracked” message out there. The Don't Get Sidetracked book is a timely message from Matthew for the young and old alike--it inspires them to stay on track in their quest to reach their highest potential. 114 Page Paperback Language: English Dimensions: 8.5 x 5.5 x 0.25"
Don't Get Sidetracked is a story of one man's refusal to allow the waves of life to drown him. Matthew Creighton defies the odds against him in his riveting true story of going from Marine, to guardian of his siblings, to law enforcement officer, to convict, and finally to become a messenger. Matthew's story is astonishing, heart-wrenching, and uplifting all in one. 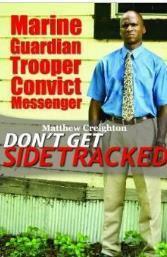 Order your copies of Don't Get Sidetracked now! Please send a message through our Contact Us section. Business and individual supporters purchase copies of Matthew's Don't Get Sidetracked book for him to give to students when he speaks at schools and other events. Leaving the book after his compelling presentation reinforces his efforts. The students are able to refer back to Matthew's book for a constant reminder of his message on making better decisions. Please support the businesses who are helping to get this information to our students, and encourage your friends and neighbors to do so. Be sure to thank our individual supporters as well. Can we count on your support? Do you believe in what Matthew is doing to help our young people? Do you need more information? If so, please call 205.440.3347 (3DGS) or email Contact@MatthewCreighton.com. Can we count on your support? Do you believe in what Matthew is doing to help our young people? Do you need more information? If so, email Contact@MatthewCreighton.com or call 205.440.3347 (3DGS).